Man: And on the back of my Perl T-shirt is a sample of modem line noise from the nineties, for comparison. 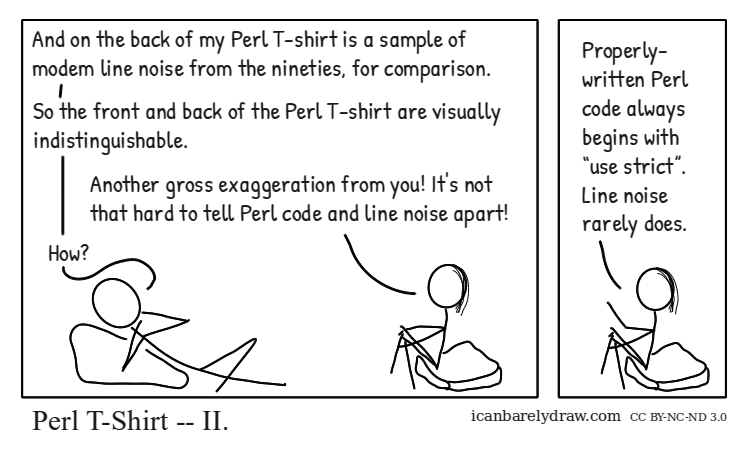 Man: So the front and back of the Perl T-shirt are visually indistinguishable. Woman: Another gross exaggeration from you! It's not that hard to tell Perl code and line noise apart! Woman: Properly-written Perl code always begins with “use strict”. Line noise rarely does. Title: Perl T-Shirt -- II. This is another ambiguous stab (at some technology) that completely escapes me.